Power ahead uninterrupted. With a swappable, rechargeable battery, 4-slot battery charger and memory backup battery, you can keep your tablets in the hands of your employees instead of in your back office. Impress customers with the elegance and durability of the ET1, built to endure bumps, varying temperatures and all-day use in an enterprise environment. Gain access to a wide range of third-party enterprise applications designed for your business and mobile workers, including assisted shopping/product comparison, merchandising planograms, manager electronic dashboards, mobile POS and item location just to start. With a multi-user login feature, the ET1 can be shared among many associates and personalized to suit their roles and responsibilities. In addition, managers can track approved applications, usage time and delegate tasks. 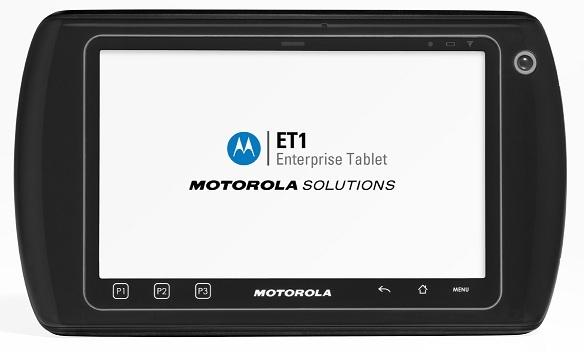 The ET1 keeps credit card and other confidential data secure, both on-board and on removable media. Lets you remotely access, manage and provision thousands of devices, even wipe clean or shut down devices that are lost or stolen, with Motorola's Mobility Services Platform (MSP).